Do you grab a bowl of ice cream after a difficult day? Do you crave pizza after hearing great news? Do you find yourself mindlessly munching while doing a rote task? Then you might be an emotional eater. To some extent, emotional eating is normal. We are taught to eat for emotional reasons rather than physiological reasons at a young age. Fall down and get a boo boo and mommy will give you an ice pop to dry your tears. Celebrate good news with a festive meal. Friends and neighbors bring casseroles and cakes during times of grief and sadness. 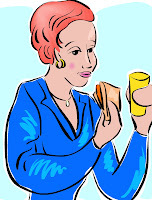 It becomes a problem when eating becomes our primary coping strategy and our physical or emotional health is affected. When we eat out of boredom, for instance, our thoughts turn to the food we anticipate and it consumes our attention, temporarily. I recently had a client who told me she ate time away. When angry, we may tear into a crunchy bag of chips, momentarily forgetting what we are angry about. However, when we are finished, we find ourselves feeling guilty and angry with ourselves. Perhaps, it is easier to be angry at ourselves than at the other person? We know that if we face our anger, disappointment, sadness, etc. we may have to cope with upsets in our lives and relationships. So, we stuff. Then, feeling like a failure for having eaten so much, we once again turn to food to cope. The viscous cycle continues. Sudden hunger as opposed to gradual feelings of hunger. True hunger begins with a slight rumbling in the stomach. An hour later you may recognize the feelings again, stronger and gradually those feelings grow. Cravings for specific food. Emotional hunger is above the neck. It starts in the mouth whether desiring a texture (crunch or soft) or a flavor. All thoughts are of food. Real hunger will be satisfied by a variety of foods. You may have certain foods your tastes prefer, but it is not just one item that will satisfy you. Eating beyond full. Once the physiological needs are met, signals are sent to the brain, letting us know we are full. Emotional hunger continues to need to fill a void. Sneaking food. Hiding and eating snacks, so that others won’t see you. Eating when angry, lonely, sad or other strong emotion. Your first reaction to an issue is to snack. Ends with guilt. Stuffing food in to comfort, then feeling guilty afterwords. Once these signs are recognized and you have identified that you are an emotional eater, what do you do? How do you break the cycle? To begin with, you want to become a mood detective. That is, you want to become aware of the triggers you have that set you off on an eating tangent. Keeping a journal of what you eat and the emotions you feel at the time are a good beginning. What were the circumstances occurring that caused the over eating? Next, you want to have alternative ways of coping with those emotions. Learn new emotional outlets, journal, sharing with a friend, change your thoughts to more positive, hopeful ones. In hypnosis sessions, we identify the triggers and create new behavioral responses to them. We can also begin to look for solutions rather than blame or shame. Delay snacking by 15 minutes when sudden hunger hits. When the 15 minutes are up, determine if you are still hungry or if it is an emotional issue you are experiencing. Take a walk, play cards, change activities when craving foods. Keep only healthy snacks on hand. Limit your portions. Prepare snack bags or portions in advance of hunger. If you divide containers of snack foods into smaller containers or bags, you are less likely to eat them all at one sitting. Create a no eating zone. If you know that you have previously sneaked food in your car or bedroom, make that off limits for all food. Become conscious of that, perhaps even putting up signs in those areas to remind yourself. Call a friend or journal when feeling strong emotions. Imagine confronting the issue and how you might feel if you were to do so successfully. See yourself working through life’s challenges in a positive, productive manner. Consider hypnosis to learn more about what your personal saboteur is and how to install new reactions, new behaviors and new habits. Thank you for this Blog. I have been an emotional eater all of my life. It is truly my only and worst addiction. I have been clean and sober for 22 years and have been through therapy for trauma, yet I still have a food problem. Yes, I have even been through hypnosis. I wish you the best in helping others. Thanks for the great advice.. Thank you for sharing this blog. I find that I tend to eat more when I am bored than when I am emotional. Also, if I can’t eat or I can’t find what I want to eat…I go shopping! As you likely already suspected, I’m an emotional drinker. /happy, sad, mad, confused, bored … you get the idea. Cheers! #’s 1 and 2 for me. Of course, I’ll eat any time. Oh, but I do love to eat! This is a fantastic post about a topic that seems to touch millions. I am very lucky, in that I seldom, if ever, allow emotions to dictate my eating habits. Your tips and this post are great not just for combating emotional eating, but for proper everyday diet and fitness. Emotional Eating is such an addiction in our society today. Some go to drug, some to alcohol and others to other toxic behaviors. The reason for the Obesity Epidemic. Conscious choices in every thing we go is so necessary and your blog post is in complete alignment with those strategies. Thank you for your sharing. I am sorry you still suffer, perhaps the right match of therapies and therapists will help you. thanks! Glad to see you, as always. set a timer if need be to help you delay the urge! That is a common time for slumps. Get up and move instead, to get the blood flowing again and drink lots of water. thanks, high compliments coming from you. I enjoy your blog so much. thank you also. I will have to spend some time with your radio program listening! I never knew there’s such thing as Emotional Eating..Now I know!